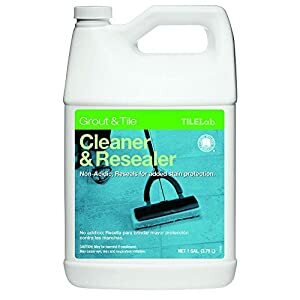 Best Grout Cleaner Reviews: Top 10 in April 2019! When handling dirty tiles, one of the hardest jobs is cleaning off old grout stains. There are numerous solutions for cleaning grout, but after reviewing and testing over 40different options, I finally managed to narrow down the number of choices to 10. 1. Efficiency: how good is the product in relation to others? Efficiency is how fast the product works, and what percentage of success it provides. This is not a perceptive factor; it’s a real trade-off that can be estimated by everyone. 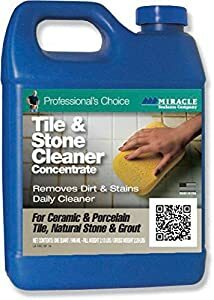 I always use a rule of thumb that goes like this: Efficiency for grout cleaners is the combination of ease of application and the speed it cleans. 2. Cos: How cheap is the product in relation to others? This attribute is straightforward all I do is compare the base price per 100 ml or gr, and this gives me the cost. I also factor in extra costs that include pads, gloves and other protective gear. The more corrosive or dangerous the product, the costlier the support items will be. 3. Methods of Application: How easy is it to apply the product? This is where I compare how hard or easy it is to use. I want a “lazy” product, which allows me a quick smear of grout cleaner, a short wait for it to work, and a quick wipe with a wet sponge to clean it up. Anything beyond this becomes tiresome. 4. Safety: How safe is the product to use and store? This is one important factor that families must factor in and manage properly. Kids love to play around, and grout cleaners are corrosive. I look for a child-proof opening mechanism and a container that does not look like a soda pop bottle. I also consider where I can store my products and I don’t want a product that is too volatile. This means that I prefer to be able to store my products anywhere, including in a hot room or in the sun. 5. Substitutes: How do substitutes compare to the product? This is a catchy one since there are many home grown remedies for everything. However, it’s really simple to compare. First of all, how difficult is it to prepare the substitute and how much will it cost. I find that all home-grown remedies are more expensive, harder to prepare, harder to apply and provide similar results. I usually cancel these out and just go for the shelf items that make life easier. Here is a link to substitutes that I personally tried and found wanting when compared to the products I review here. 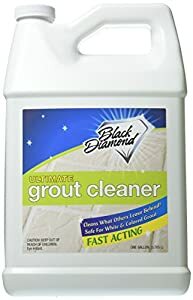 All grout cleaners are similar; they use a caustic substance to eat away at the grout and any other dirt that accumulates on the surface that needs to be cleaned. There are many different ingredients and mixes that create varied products. The bottom line is that unless you have a degree in chemistry, it is the end result that matters. All the products boast good Ph levels, and yet all the products require you wear protective clothing. Just keep that in mind, there are no safe products, all have to be kept secure from children and stored safely. 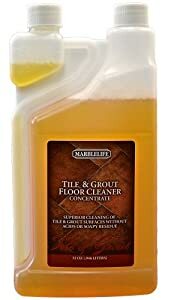 Before I present the 10 best grout cleaners, it is important to understand that cleaning tiles and grout is a mandatory requirement in any household or business. All surfaces accumulate dirt as well as bacteria. Showers and Kitchens are especially prone to such attacks, and you will notice the “gunk” massing up in corners and along grout lines very quickly with daily use of the surface. Don’t let the “gunk” go black, once it is black it means that bacteria have massed up and taken root in the grout. Cleaning rooted “gunk” is harder than just swipe and wipe, you will need to brush it and maybe clean twice. It also means that the grout is compromised, porous and will need sealing. So, make sure you clean your surfaces with a routine frequency. 4. Rejuvenate Non-Toxic Bio-Enzymatic Safe, and Scrub Free Tile and Grout Cleaner Lighten and Brighten Every Time – 24 oz. 5. Custom Building Products: Grout and Tile Cleaner and Resealer TileLab 1 Gal. This is an acid free grout cleaner that comes in both a spray-on container and a bulk container for refilling when the spray on is empty. The manufacturer, Black Diamond claims the product is acid free, this is a good sign but does not mean that the product is not corrosive. It is also not useful for calcium and water stains, so if you have those pesky calcium spots, this is not the product for you. In fact, this product requires you wear protective clothing when applying it. I tried it out, and the results were great. It really does only take 2 minutes for the applied surface to be cleaned. Here is a link to the product data sheet. 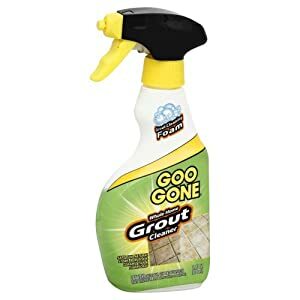 This grout cleaner comes in a bulk container as well as a spray bottle. This means you can either pour it into a pail and then mop it or sponge it over the area you want to clean up. Or, you can spray the surfaces you want to clean. I have tested this product and am satisfied. Their site gives a lot of details and information and is useful for both professionals as well as the average consumer. They also give a nice video of how to apply the product, and here is the link. This non-toxic grout cleaner comes in a pre-measured bulk container. This means you pour a measured amount into a pail and then mop it or sponge it over the area you want to clean up. I have to hand it to Marblelife, their products are very good, and their site is extremely informative. I used this in a test and was very satisfied with the results. Another bonus is that it doesn’t smell as bad as some of the other products. 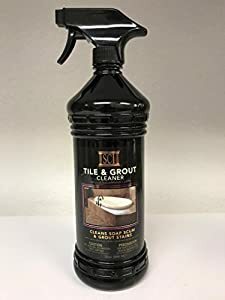 This grout cleaner comes in a spray format and has a 1-gallon refill available that costs $31 when you finish the contents. Rejuvenate suggests you buy their microfiber cloth to help with the application, something I tend to eye suspiciously. I ended up buying the cloth, at their price it was still OK. The cloth is a standard one, and the product delivers. 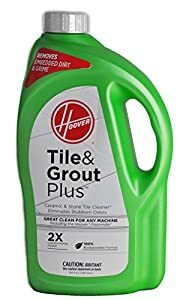 Overall, this is a good grout cleaner at a very good price. This product is very cheap when compared to the others, and it performs a very good job. This grout cleaner also comes in a bulk container. This also means you pour into a pail and then mop it or sponge it over the area you want to clean up. I personally don’t think this is as great as some of the other products, but it does work well and it’s not expensive. The Custom Building Products site is a commercial site for professionals specializing in flooring, so they have done their homework, and the product is used by professionals. The Link to the TileLab product specification sheet. 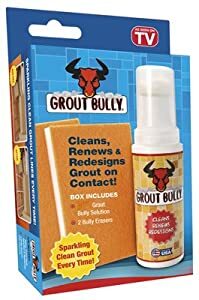 This grout cleaner comes in a spray format and is very easy to apply but is a costly item. Its redeeming factor is its efficiency and versatility. I also like its name, catchy Googone, and their website offers some great “how to” videos, which are informative and useful. They helped me understand their product as well as others, a bit more. I suggest you watch the Googone video even if you decide to use another product, the application and explanations are very good for general cleaning. This grout cleaner also comes in a bulk container. This also means you pour into a pail and then mop it or sponge it over the area you want to clean up. While this one has a great name “Hoover,” it has a high price, perhaps the brand raises the price, while the product is not as good as it could be. Being the international site it is, Hoover offers a lot of supporting products besides this. I tested it out, and it works well, as it should do. This grout cleaner uses a spray-on, a method which makes the application much easier. You spray it on, and then wait for it to work. After it is finished, you easily wipe the surface off with a wet sponge. This is very similar to Goo Gone but with a better price tag, so if your budget is limited, this will make a versatile alternative. Another issue is that Magic American has a great SDS page, where you can get your pdf Safety Data Sheets online. 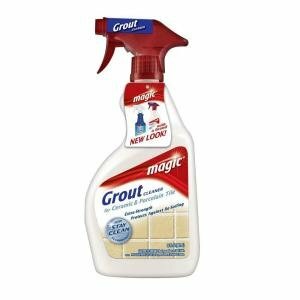 This grout cleaner uses a spray on a method which makes the application much easier. You spray it on, and then wait for it to work. After it is finished, you easily wipe the surface off with a wet sponge. It comes with two “bully erasers” that make cleaning the surface easier and cheaper. This is a relatively safe cleaner, comes with an easy application container and release system, and includes two pads for application. Yes, it’s a bit costly, but it is very good value for its price. Now it’s time to say a few things about Harvest Trading Group; one is that they have a direct sales site and you can get the same product online directly from them. This grout cleaner uses a spray-on method which makes the application much easier. You spray it on, and then wait for it to work. After it finishes, you easily wipe the surface off with a wet sponge. This grout cleaner container looks expensive but is slightly cheaper than Magic or Goo Gone. SCI is a leading brand in stone care, and their products are very efficient. 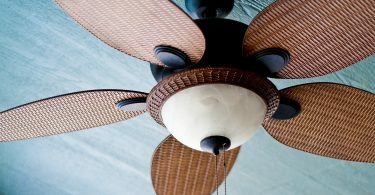 They also take care to show off their products as much as they try to provide a good quality service. There are literally hundreds of grout cleaners to choose from. After I literally tested over one hundred different brands, this was the top list I came up with. These products all provide an excellent value for money. They all work well, are easy to apply and produce good results in minutes. Ultimately, a grout cleaner needs to be easy to apply, quick to act and easy to clean off. It should also not stink and not be too poisons, even if all of them are dangerous. Storage should be standard with no exceptions. Remember that you will need an application cloth, a sponge, water, as well as safety equipment. I used strong elastic gloves, and I wear glasses. If you don’t wear glasses, then get a pair of safety goggles and wear those. You do not want a drop of this touching your eyes. Also, I wore cheap work clothes. Usually my old worn throw-aways I keep for dirty house work. I suggest you do the same. All such products must be kept out of the reach of children, so make sure you rely on keeping them high up and out of reach. Don’t rely on child safety caps. I find that the Harvest Trading Group provides the best and cheapest option and therefore stands out at the top. SCI is the runner-up with a really good product supported by exceptional service. 4. Magic, Rejuvenate and GooGone all provide equally good products. Why should I clean my tile & grout? Tiles gather dirt, dust, and bacteria just like any other surface. The main difference between tiles and wood or carpet is that you can clean the surface much quicker and easier. Also, unlike biological surfaces such as wood, and spongy surfaces such as carpeting, the tile surface is hard and the contaminants only over the surface. This means that you don’t need to worry about hidden or accumulating dirt and mites as you might have in carpets or worry about wood rot and insects as you might with wood. Cleaning the grout is important to retain the integrity of the bonded surface as well as bring back the original color and sheen of the grout. How do I clean my tile & grout? There are a number of ways to clean tiles and grout on a daily basis. This assures you retain a clean surface at all times. This also maintains your tile and grout surfaces so that you need only use grout cleaning solutions once in a while and not on a weekly basis. I recommend using a damp sponge with a soap solution, preferably anti-bacterial, and swipe the surfaces based on usage. Some floors and walls are frequently used, while others surface rarely meet human touch. For excessively dirty grout lines, you might need to use a brush or scotch-pad to get at the ingrained dirt. Cleaning floor tiles require a standard tile cleaner, and you maintain them either once a day or a number of times per week. You will need to swipe the floor or surface with the cloth or mop that has the solution on it, then wait for it a few minutes. You then wipe the surface with a sponge or another wet cloth, but this time one that has water in it. Cleaning the surfaces comprehensively can be done once a month, using various tools such as mops, sponges, cloth. There is no one best way, just cleaning the tiles on a frequent basis will maintain their integrity. How often should I clean my tile & grout? Different surfaces in different locations require cleaning according to the number of times they come in contact with contaminants. This means that a frequently used surface needs to be frequently cleaned. In some cases, surfaces may be cleaned once a week using special cleaning materials, such as shower areas, kitchen surfaces and area’s that are frequently stood on with dirty or soiled shoes. Seldom used surface need to be cleaned once a month. How long will it take to have clean my tiles? In general, size matters. The larger the surface, the longer the task. However, especially dirty surfaces might need more application than others. The rule of thumb is that every 25 square meters will take around 45-90 minutes dependent on the level of dirt needed to be cleaned. A straightforward swipe, wait and will take 45 minutes. This includes application; swipe the surface, then waiting the 2-3 minutes and then wiping the surface after completion. What happens when the grout line is Black? If your grout lines are black, it means that the bacteria have taken root in the grout, and you will need to brush the area as well as clean it twice. After which you will need to use a sealer to reseal the grout. The rooted black gunk has made your grout porous, so it will take root again very quickly unless you seal it and clean it properly.